Bette Cassatt just finished work on Haxan Film’s (the makers of The Blair Witch Project) latest film which has not yet been officially announced. She is currently playing the lead role in the film Dreams, which will be part of the anthology film Tales of Poe, where she will get to share the screen with Horror Legends Adrienne King, Amy Steel, and Caroline Williams. Next, Bette will play Brenn in the new fantasy web series The Broken Continent by Ciscovaras Pictures, and the role of The Challenger in Jamie Nash’s Scrolls ­– another sword fighting fantasy film. Bette was also one of the lead roles in Razor Days along with Horror Icon Debbie Rochon. Her most ambitious film role to date was in the epic Victorian Horror film A Sweet and Vicious Beauty as the axe-wielding Narcissa Sentinel with Piranha Pictures. Her stage work includes: a touring production of a 4-actor version of The Three Musketeers (D’Artagnan/Queen Anne) , a 2-actor version of The Lion, the Witch, and the Wardrobe (Lucy/White Witch), The Prisoner of Zenda (Princess Flavia) – 1st Stage, The Cripple of Inishmaan (Helen) – Maryland Ensemble Theatre, A Midsummer Night’s Dream (Hermia) – Maryland Ensemble Theatre, The Red Balloon (Mlle. Helene) – US Premiere – Adventure Theatre, and The Life of Galileo(Virginia) – Studio Theatre. 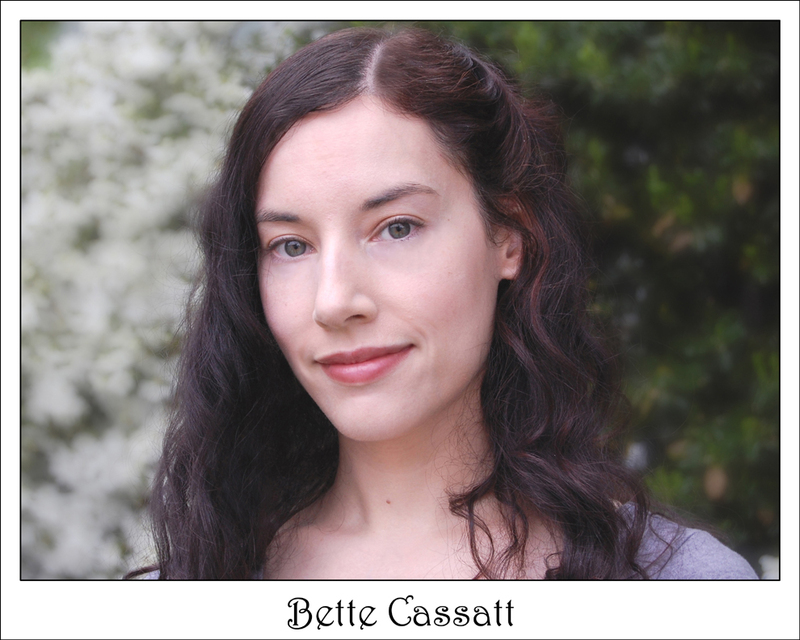 In addition to acting, Bette has over 15 years of experience working with swords and other weapons. She was awarded “Best Female Actor Combatant,” as well an award for ingenuity and innovation, at the National Stage Combat Workshop by the Society of American Fight Directors. Besides performing fights and stunts for TV and film, she has also performed fights at The Kennedy Center, The Folger Shakespeare Library, The National Theatre, The Women in the Arts Museum, and The Shakespeare Theatre. She has also become the face of Hasbro’s Force FX Lightsabers for ThinkGeek.com. Bette’s costuming work includes A Sweet and Vicious Beauty, The Three Musketeers, and some pieces for Dreams. She has also made award-winning costumes for her Shetland Sheepdogs who also performed in live events, parades, theatre, and film. Narcissa. 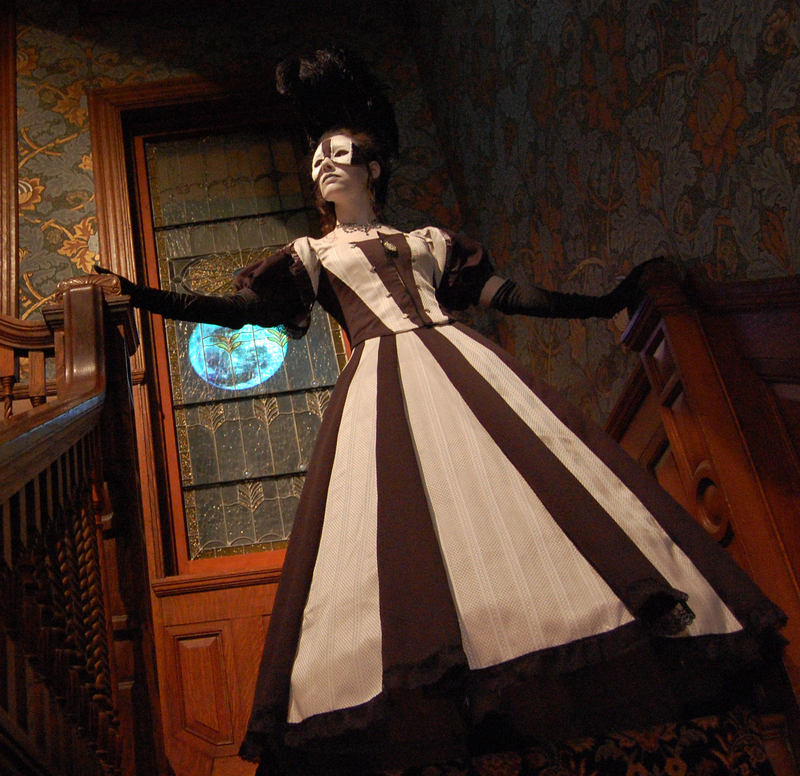 Black and White ballgown (Bette’s design). Finished the mask the day of the shoot. I think Narcissa had about 13 different costumes in this film. I also costumed the masquerade ball. This is my favorite one. 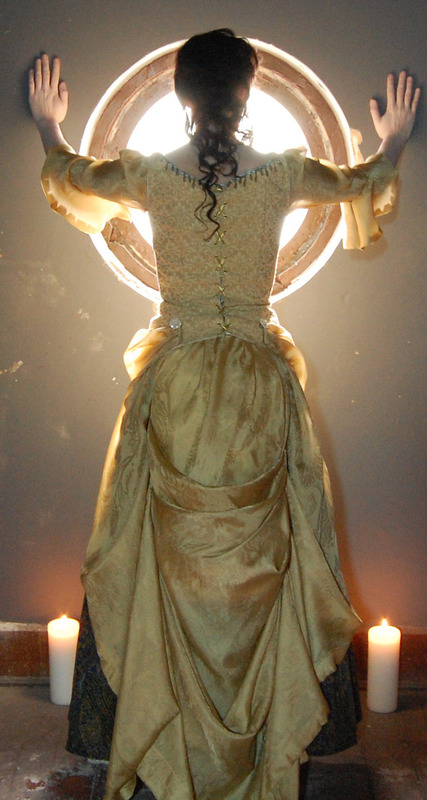 I also had to make a stunt dress, since I wore my real wedding gown in the film and I didn’t want to ruin it. I made a “How To” for the stunt dress on the Cut Out and Keep website. There are several photos there. I had 4 days to make the stunt dress. It took me about 80 hours. AB note: Click here for a piece about the filmmakers of Tales of Poe including some exclusive photos from Dreams. How I feel about a project depends upon the project itself, what is asked of me – and my confidence level regarding that thing, and the timing of it. For the most part, a new project is exciting and fresh and full of possibilities. My mind overflows with ideas – both crazy and practical and delights in trying to figure out what will work. Sometimes I’m thrilled having to learn a new skill. Or getting to work with incredibly talented people I admire. Or getting to figure out how to do something I have no idea how I’m going to do. I have my hand in several different artistic pursuits – acting, fight choreography, costuming, and writing. And whatever it is that I’m starting, there’s always the great enthusiasm and hope that this will be the best thing ever! Auditions are much more fun, satisfying, and less stressful, when I can just enjoy the fact that I am playing a character – for those few moments – how I want to play that character, before a director puts in his/her ideas. When I can get myself in that mindset, I always leave an audition feeling happy – even if I’m pretty sure I’m not going to get cast. Once I have been cast in something, new fears crop up. Theatre and film are both collaborative arts, so there’s always that gnawing dread that somehow I’m going to let everyone else down. With costuming, which is something I’m not formally trained in, there’s always a sense of trepidation before I make the first cut into the fabric. But what’s wonderful to me is that when I complete a costume I have something tangible I can hold and look at, and really feel a sense of satisfaction that I made something that exists in the physical and not just in time, as opposed to acting. Of course, I can also see all the little errors I made and all the places I could have done better, but I’m starting to be able to let such things go and enjoy the imperfections and the character those imperfections give the piece. 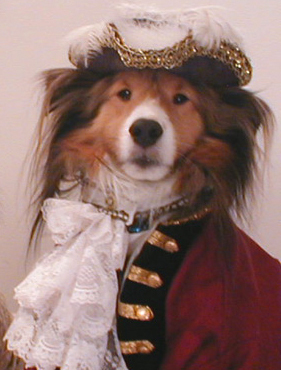 Caption: My dog, D’Artagnan as Pirate Calico Jack Rackham. The dog costumes were really the first major sewing projects I did. The Musketeer costume was first and the Pirate costume was the second. I was scared to try to make human clothes. There weren’t any patterns available at that time, so I made everything from scratch from the pattern to the hats. When I’m in the midst of working on a character, after I’ve explored the script for information, I like to look for songs and pieces of artwork that I think touch on moments of my character’s life, emotional state, and journey. Sometimes I will actively search for a song for my character – and just the hunt helps me figure out what works and what doesn’t. At other times, I will just accidentally happen upon the perfect thing (a song or a painting) that makes the character click for me. Once I’m working on something, I become very aware of the time restraints. There isn’t always enough time to do everything I’d like, and sacrifices have to be made. From Dreams. The Queen of Dreams and The Dreamer. The Queen is played by horror legend Adrienne King (from the original Friday the 13th film). Sometimes there’s the feeling of relief to be finished. Sometimes joy at the wonderful thing I was lucky enough to be a part of. Sometimes there’s sadness and a sense of loss. And sometimes there’s an epiphany about the project two weeks later which would have been very helpful had I thought of it earlier. Narcissa in Sweet and Vicious Beauty. You are so incredibly talented, Bette! The costumes shown in this article are stunning! And…you are beautiful! Congratulations! Jaime, It means so much that you read Bette and Tony’s visits. I still remember writing your biography in Ms Natale’s 7th grade English class, and how at first I was pouting because I wanted to stay attached at the hip to my best buddy Mari, but then I got to interview you and write about you and I have admired you ever since.